G. Vidal de Miguel, M. Macía, “Method and apparatus to improve the separation capacity in a sequence of ion filters incorporating at least two ion mobility analyzers”, USPTO 8,907,275 B1, Dec. 9, 2014. Granted. G. Vidal de Miguel, “Method and apparatus to produce steady beams of mobility selected ions via time-dependent electric fields”, USPTO 8,378,297 B2, Feb. 19, 2013. Granted. G. Vidal de Miguel, “Transversal Modulation Ion Mobility Spectrometer with reduced voltage and improved robustness and resolving power”, USPTO 62/114,601; Feb. 11, 2015. Patent application. G. Vidal de Miguel, “Method and apparatus to generate beams of ions with controlled ranges of mobilities”, USPTO 62/077,412; Nov. 10, 2015. Patent application. G. Vidal de Miguel, “Ionizer for vapor analysis decoupling the ionization region from the analyzer”,USPTO 8,461,523 B2, Jun. 11, 2013. Granted. 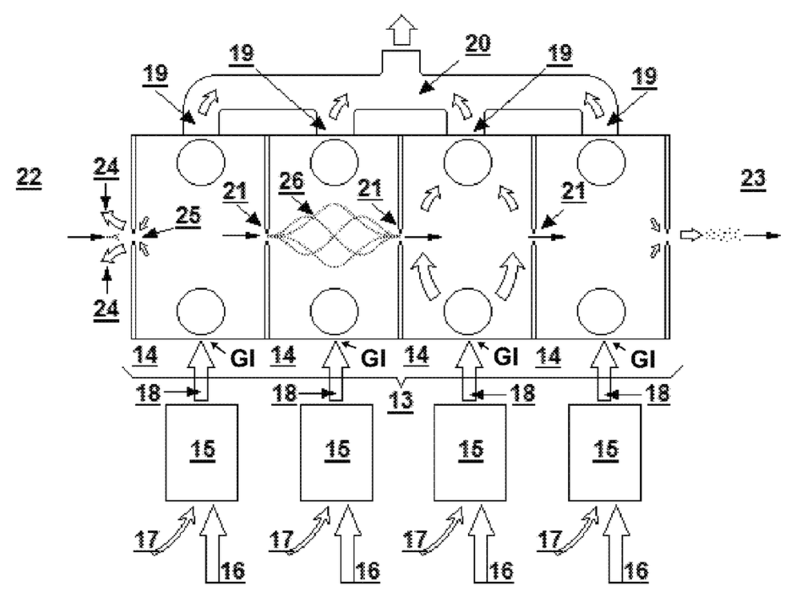 G. Vidal de Miguel, J. Fernandez de la Mora, “Method and apparatus to sharply focus aerosol particles at high flow rates and over a wide range of sizes”, USPTO 8,247,764 B2, Aug 21, 2012. Granted. G. Vidal de Miguel, “Ionizer for vapor analysis decoupling the ionization region from the analyzer”, USPTO 8,217,342 B2, Jul. 10, 2012. Granted. G. Vidal de Miguel, “Method and apparatus to desolvate ions at high pressure and to improve transmission and contamination in the coupling of mass spectrometers and mobility spectrometers with ionizers”, 14/516,803 (USPTO), Oct. 17, 2014. Granted. G. Vidal de Miguel, D. Zamora, M. Amo, A. Casado, G. Fernandez de la Mora, J. Fernandez de la Mora, “Method for detecting atmospheric vapors at parts per quadrillion (PPQ) concentrations”, EP2538208 A1, Jun. 25, 2012. Pending. R. Borrajo Peláez, E. Criado Hidalgo, G. Vidal de Miguel, “Method and apparatus for monitoring stress levels or sudden changes of humor in humans or other individuals in real time”, 13/161,662 (USPTO), Jun. 16, 2011. Pending. G. Vidal de Miguel, “Method and apparatus to induce detachment of flagella propelled microorganisms from walls and to countermeasure their ability to swim upstream”, US 2010/0076386 A1 (USPTO), Mar. 25, 2010.